Refresh, renew, re-awaken the elemental beauty of land. Clear historical imprints, land trauma, curses, ghosts, former inhabitant emotional – mental energy, EMFs, geopathic stress affecting health, and energy patterns attracting disharmony. Land Harmony Awakens More Joy! What is a Land Clearing? 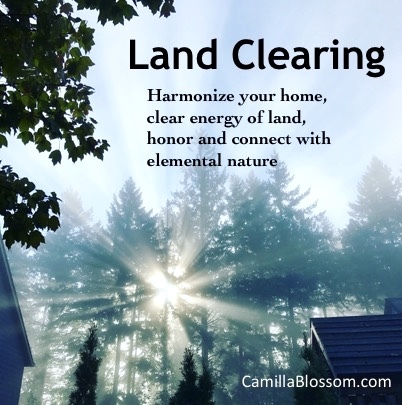 A Land Clearing not only releases and cleanses the energy of land, it alsohonors the spirits of land—Ancestors, trees, plants, animals, fairies, devas, nature spirits, elementals, waters, elves. The most powerful shifts on land can come from freeing up the spirits of the land to do their work. The land awakens when we engage with the spirits and tend and care for the land as co-creative contributors. Release of emotional energy, congestion, and people’s attachment to land that may linger on the land and create confusion for current residents. Clear out any dis-incarnate spirits, ghosts, or misguided spirits that may bring darkness, interference, confusion energy into land. Clear energies that lowers our vibration: conflict, violence, trauma, fatigue, confusion, entities, devices, feminine, jealousy, illness, abuse, etc. Release and clear historical imprints so difficult patterns stop repeating and attracting more of the same. Balance elements of air, fire, water, earth to create elemental harmony. Create sacred space and energetic protection from unwanted energies. Anchor a new energetic land template—blueprint of sacred geometry to support higher frequencies of evolutionary growth of all beings. Land retrieval to restore the power to the unseen realms of fairy, elves, nature spirit, elementals, and ancestral guardians for strengthening of plants, soil, waters, and relationships with all beings of land. Flower Essence Formula to offer land as an honoring and balancing tool. Make recommendations for changes and correctives and ways to invite more joyful new fields of energy. For example, magical gardens, altars, clearing of physical debris, repurposing people and elementals. What is a House Clearing? A House Clearing is much more than smudging (the burning plants to cleanse negative energy from a space). I address the source of the imbalance or negative imprint so it will not return. I work with the Deva or Spirit of the House to release old patterns, emotions, thought forms, history, imprints, and darkness to free up energy. New patterns of health, harmony, and wholeness are anchored in the space. I tune in and read the subtle energy of the building and work intuitively with the spirit realms to create an environment that flows with ease. Counter geopathic stress from underground water and earth related stress that can cause sleep disturbances, emotional issues, and affect sensitive inhabitants. Clear out any dis-incarnate spirits, ghosts, or misguided spirits that may bring darkness, interference, confusion energy into space. Balance technology and EMFs (electro-magnetic frequencies) from electrical outlets, internet, computers, cell phones, televisions, other devices. Balance elements in house—air, fire, water, earth—to create grounded space. House spirit retrieval to restore spiritual power of house or building. Make recommendations for changes, correctives, gardens, rituals, grids, altars. “I met Camilla at a land blessing hosted by a friend and decided she was a natural teacher—not letting herself get in the way of the stories and instruction she provided. Then that same friend proposed that I have Camilla do a land and house clearing on a house project I had recently acquired. I am a senior law and policy advisor for a federal agency. I was not sure as to why I would need that done but given my impressions as related above, I agreed to it. My project is a late 1800s house half burned in 1977 and remodeled by California wood butchers without the art. Many challenges included the accumulation of a lot of stuff—anything from old TV Guides to dirt. Cleaning the house and land was slow going but no feeling of manevalance.